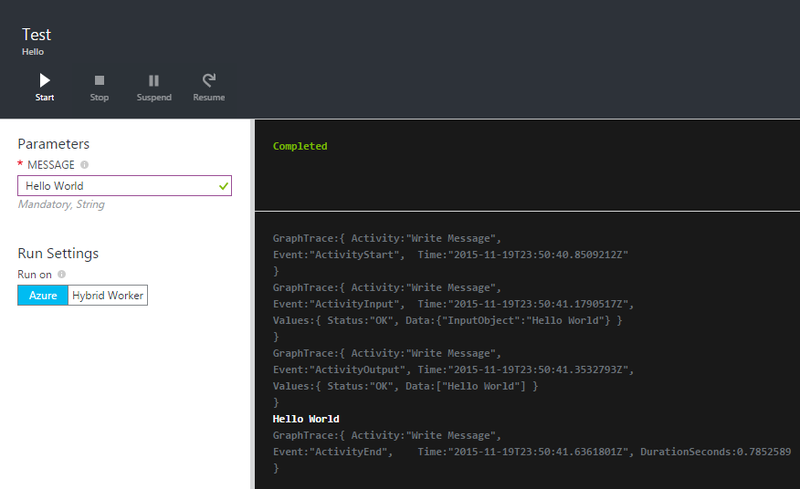 For graphical runbooks in Azure Automation in the Preview portal, you can now enable activity-level tracing and set the amount of tracing you want. The tracing configuration is located on the Settings blade for each runbook. You can choose None, Basic, or Detailed levels to fit your needs. Tracing is available only for graphical runbooks. Basic tracing includes the start and end times of each activity. Detailed tracing includes the Basic tracing plus the input and output data for each activity. Currently, the trace information is written to the PowerShell Verbose stream; so in production tracing, you will also want to enable logging of verbose records. You can use this data to help understand what is happening within your runbooks in production or test runs, and therefore improve the ability to troubleshoot issues.